Thank you for purchasing the JaWesome portfolio theme. If you have any questions that are beyond the scope of this documentation, please feel free to ask us at the themeforest.net comments section. You can e-mail us at jaw(a)jawtemplates.com as well. 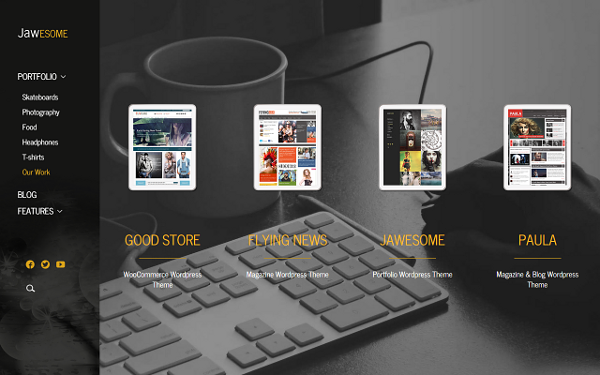 The JaWesome portfolio theme has been tested in WordPress 3.9. However, we strongly recommend that you always use the latest stable version of WordPress to ensure that all known bugs and security fixes are addressed. Upload the JaWesome.zip file through the WordPress admin backend (This will ONLY work if the server that hosts your website allows upload limits greater than 6 MB. Please note that the most hosting providers have only up to 2 MB file upload limit). If you prefer direct access to your folders on server (or uploading the file using WordPress doesn´t work), use this method. First, unzip the JaWesome.zip file, then upload the extracted JaWesome/ folder to /wp-content/themes/ using your FTP client so that the structure was as follows: /wp-content/themes/JaWesome/. If the upload of theme was successful, you can see the JaWesome in list of the downloaded themes. You can activate it now. To set up your theme, navigate to Appearance > Theme Options (see the 2. JaWesome Settings chapter below). After you build your site, we recommend that you deactivate all the shortcodes you don't use in Plugins > J&W Shortcodes. Remember that loading the unused parts of various add-ons may needlessly slowing down your web. We also recommend use of some PHP OPCache on your hosting - e.g. APC and XCache. On the Wordpress side we recommend installing the W3 Total Cache plugin, in which is advisable to activate combination and minification of CSS and JS scripts and activate cache for clients (Gzip, file cache). In order to keep your theme bug free and ensure its continuous optimum performance, we recommend that you regularly follow updates or automatic notifications of new updates that we release. So, how to update? 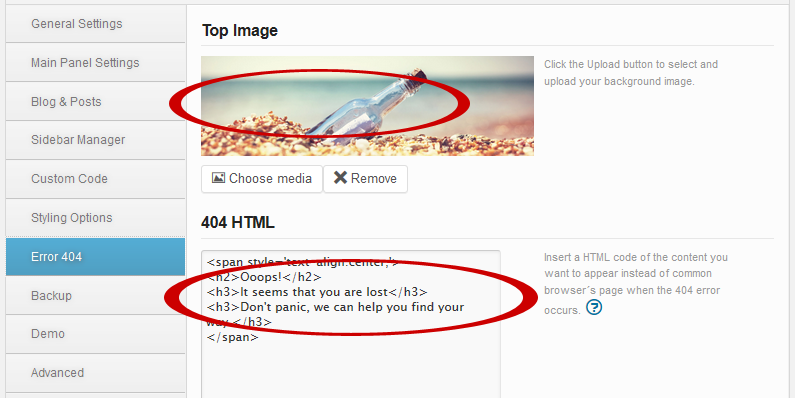 the best way is to use the Envato Wordpress Toolkit plugin. Please follow this tutorial: http://premium.wpmudev.org/blog/envato-wordpress-toolkit-a-themeforest-auto-updater/. If for some reason the mentioned updating process isn't successful, we recommend that you copy the necessary files directly via FTP. To learn more, follow this video tutorial that shows the generally valid procedure using another our theme taken as an example. HINT: We strongly recommend that you make a backup before each updating of your theme. You can customize the overall functionality and look of the theme to your needs using the options in Appearance > Theme Options. Here can be set up some of the most basic properties of your site. You can upload your favicon or manage transition effects. Click [Upload] button and upload your prepared 16px × 16px PNG/GIF image that will represent your website's favicon. NOTE: If you use some other plugins, they may work improperly if you turn this option on! 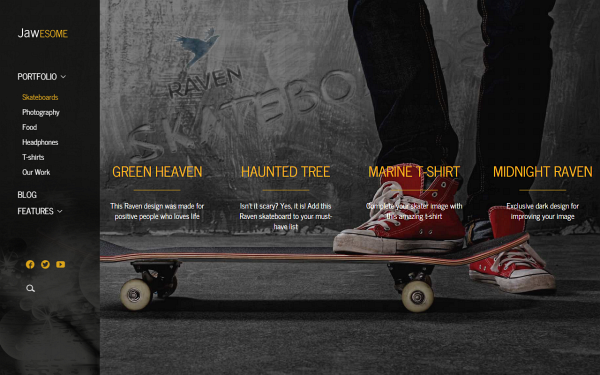 Choose a transition effect you want to apply when passing through pages/posts. Here you can choose a spinner animation that appears during loading of content. To see how the Ajax spinners look, visit the tobiasahlin.com/spinkit/ demo site. There is a possibility to hang any custom element on your page in such way, that it is permanently displayed on its place, independently on how the remaining main content changes when a visitor refreshes the page or passes through your web. To specify the element(s) to be excluded from re-loading a page (i.e., to be displayed on all your pages), enter their classes or ID names into this field. This feature allows to ignore all links that contain the strings you specify. Enter these strings into the field and separate them by coma. the following options allow you to customize placement/look and behaviour of your main panel. Choose one of the possible placements of your main panel. Logo: Click the [Upload] button to select and upload your own logo. To remove the uploaded one, use the [Remove] button. Retina Ready: This option allows to display your logo in high quality on the Retina displays. NOTE: Although you can use your logo with the dimensions you need, let us take our logo as an example to explain the issue. Size of this logo is 234×88 px if it has not to be retina ready. If you prepare a retina ready logo, you should create it with double width and height, i. e. 468×176 px. Remember that if the Retina Ready option is set on, your logo will be displayed in its half size on non retina displays, so it won´t affect the actually displayed size. Make sure you have set the option off if you use a standard sized logo (234×88 px), otherwise it couses that the logo will be displayed too small on both of display types. 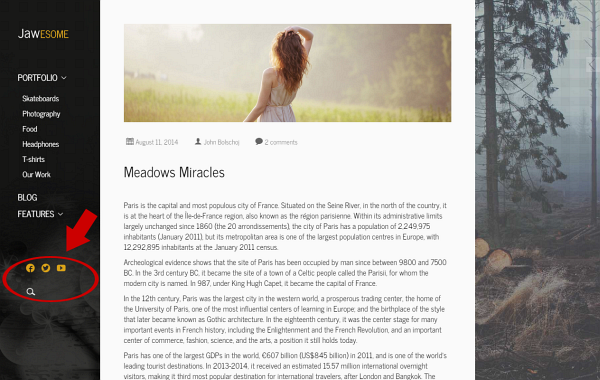 Custom Featured Content: Here you can put your own content to be displayed in the featured area. You can use a simple text, HTML content and shortcodes as well. To get a shortcode you need, create but don't save a new post and use the shortcode button in its WISIWYG editor. Copy the shortcode/s into clipboard and paste it/them into this field. For more information, see the 6. Shortcodes chapter. Show Search: Decide whether or not to enable searching on your site. Turn this option on to show the search link in the featured area or turn it off. This is the featured area that you can customize by the Custom Featured Content and the Show Search options. 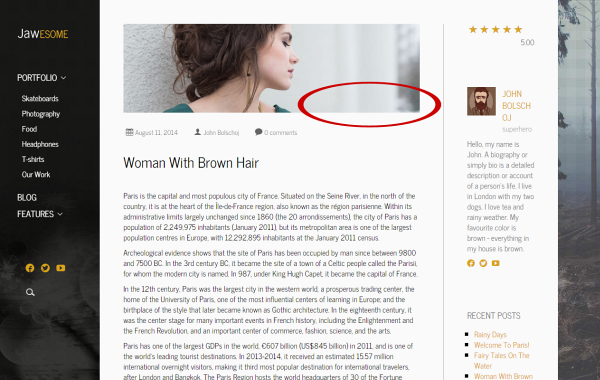 You can decide to show or not to show the Rating, About Author and Share This boxes in your portfolio. Here is the place, where to make the default settings for the whole site. You may, however, make a different settings for any particular portfolio item. To do it, open the portfolio and set its options according to your needs. For details, go to 5.2 Portfolio Items subchapter. Here you can find all the options you need to set up your blog and posts. Click into the field/dropdown list and choose all categories you want to fetch posts from. Here you can choose the posts order way you prefer – ascending or descending. Here you can set up what has to be shown in the post preview. Meta Author: Choose whether or not to show author´s name. Meta Date: Choose whether or not to show date. Meta Number of Comments: Choose whether or not to show number of comments in the post preview. Post Date Format: Define the date format for your posts. Please visit the link next to this option to learn how to use the characters convention. 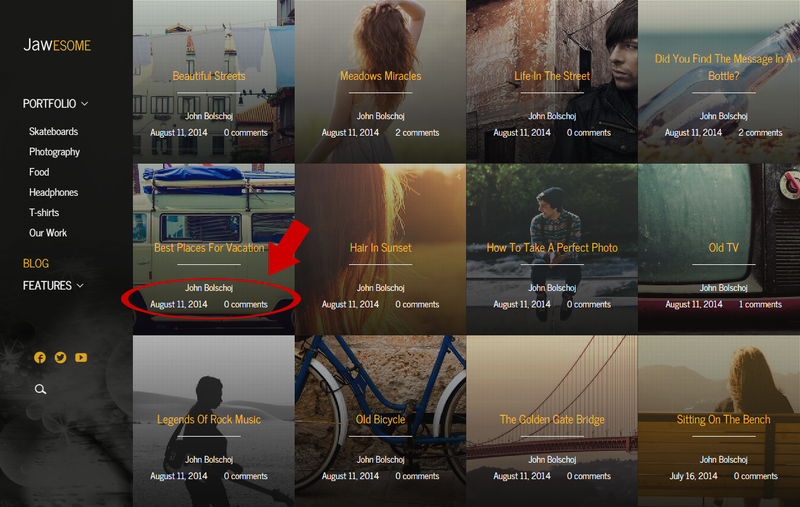 Look at where the Meta Data appear in a post preview tile on the blog overview page. There are three preset layouts for your post content. Here you can choose one of them. Depending on what layout you choose, the options below will vary. 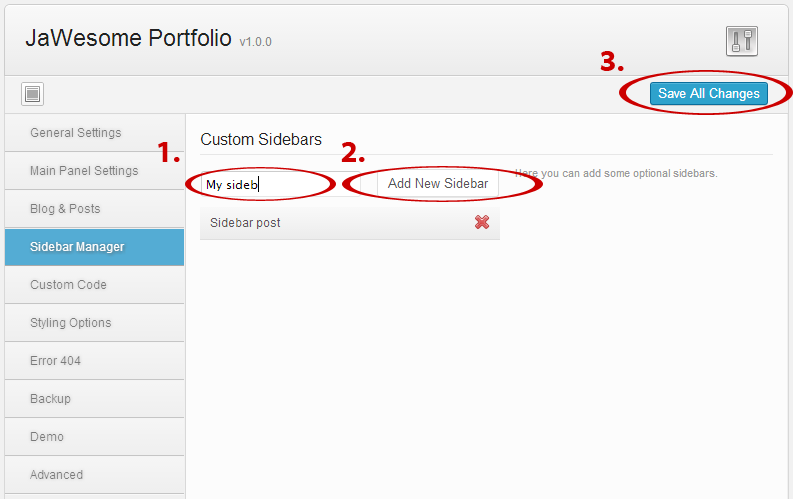 You can choose one of the sidebars, you have created in the Sidebar Manager settings and add it to the right. Choose whether or not to enable an area with various sharing options available below the posts. Turn this option on if you want to show the related posts section on your post page. Turn this option on to show featured images in the related posts section on your post page. Enter a number of related posts you want to show. Choose whether or not to display tags below a single post. An example of Tags and the Sharing Post Area displayed on a post page. Choose whether or not to display the author's name with photo and description in a post. Here you can set up what has to be shown in a single post. Meta Post Author: Decide whether or not to show author´s name. Meta Post Date: Decide whether or not to show publishing date. Number of Comments: Decide whether or not to show number of comments in posts. If enabled, here the Meta Options take effect in the sample single post. You can add icons of the most common social networks and services you want the post to be shared on to the Sharing Post Area. Choose from Facebook, Twitter, Google, Pinterest and E-mail items. Turn on or off the Show comments depending on your choice. Here you can set up your Facebook Comments. To make the options work, you have to enter your Facebook App ID in the Advanced section. Facebook Comments: This option gives you choice to toggle between wordpress and facebook comments. Number of Comments: Enter a number of comments to display. This is the place where you can add your optional sidebars. Fill in the field with a name you want and click the [Add New Sidebar] button. In the same way you can create all sidebars you need. Clicking the cross removes the chosen sidebar. Once you are done, don't forget to save your changes. Notice that you find the created sidebars in the Widgets settings and can assign some widgets to them. In this section you can choose some color presets for your theme, as well as customize color variations according to your wishes. Colors can be inputted via the colorchooser popup selector or manually using a hex code in the input field. bar and the pointer across the color palette until you find the color you need. HINT: As there are lots of particular color settings for various elements of your site, we recommend that you follow the explanatory screenshots under the preview icon next to some of the styling options to be able to better understand the settings looking at where they appear on your web. Background Color: Pick a color from the palette or enter a hex code. Background Image: Click [Upload] button to upload your background image. To remove the image, use the [Remove] button. How to Use Background Image: There are two possible ways to use your background image. You can use just the clear image, or moreover to overlay the background by pattern. the second option is advisable e. g. if the image is not sharp enough or simply if you like this attractive effect. Background Video (mp4): Choose a video in mp4 format you want to use as background of your portfolio category. Background Video (WebM): Choose a video in WebM format you want to use as background of your portfolio category. Background Pattern: Decide whether or not to use a background pattern. NOTE: If you use a video as background, both the MP4 and WebM formats must have been set, otherwise a proper functionality won't be ensured. To learn more about the issue, visit this page on www.w3schools.com, please. Here you can define custom colors of some groups of elements on your web. Load Color Scheme: Choose a color scheme you want to use. These colors affect all the main graphic elements of the theme, but you can also modify many of individual elements by using the following settings. Theme Color 1: This color affects the main elements like titles in sidebars and background of text elements like boxes, comments etc. 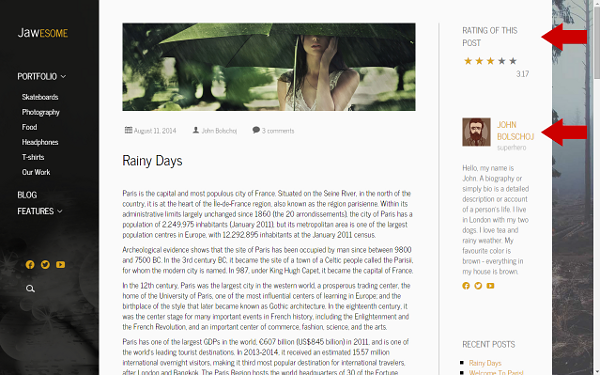 Theme Color 2: Affects especially background of text elements like boxes, comments etc. Theme Color 3: This color affects lines, borders and similar elements. CAUTION: Selecting a color scheme in the Load Color Scheme option will cause loss of the existing color settings. After selecting an item you will be informed about this and asked whether to continue. HINT: As there are various combinations of text and background elements included in the preset Theme Colors, we recommend choosing rather mutually contrast Theme Colors (1, 2, 3) in order to achieve a good readability of your page content. Note, that this theme doesn't show scroll bars in the common way you know from your browser, but replaces them with its own ones. Here you can choose a color of the scroll bars. These options affect look of form on your site. Here are several settings available to define colors of your menu items. For details, see the related descriptions and/or click the preview icon. These options allow you to set font colors for paragraphs and links. For details, see the related descriptions. Define color settings for your posts and pages. For details, see the related descriptions. Title Font: Here you can change the title font. This doesn´t affect the font size, both the typeface and color remain standard. Paragraph Font: Paste your paragraph font name into the field and choose a size, style, and color from the dropdown lists. Here you can define font sizes for various text elements on your site. Enter all the values in multiples of the Paragraph Font size you have set above. Use decimal point in the values. These options affect the main elements of the "About Author" box. NOTE: the colors you set here will be used as default for the whole site, but you can set different colors for each portfolio category separately (Portfolio > Portfolio Categories) assuming that the Display on Page option has been set to Columns of Categories or Columns of Items for such categories. For details, go to 5.1 Portfolio Categories subchapter. Here you can create your own custom html 404 Page with or without a top image. 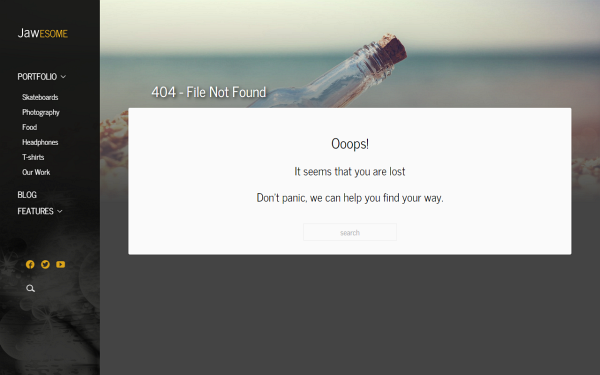 Simply set the Top Image and enter the 404 HTML code you want to appear instead of a common browser's page when the 404 error occurs. If you leave the Top Image option empty, the top area will be filled with the background color you have set in Styling Options > Posts/Pages > Top Background Color. Look at how the sample Top Image and 404 HTML code (fig. 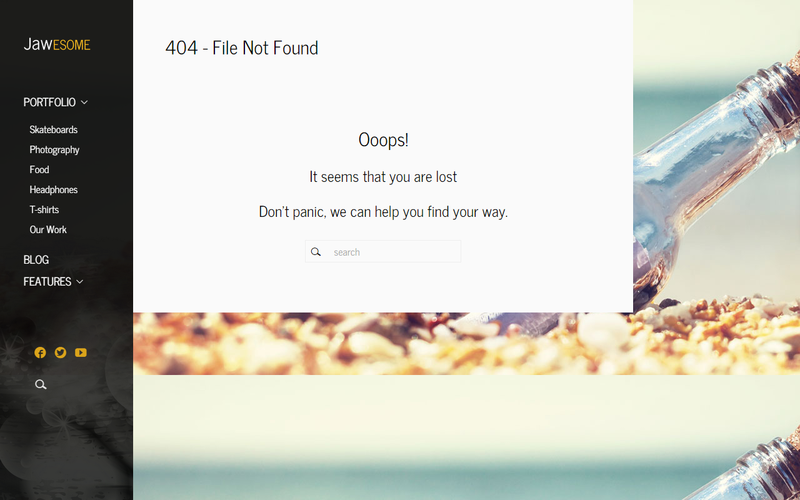 above) appear on your page when the 404 error occurs. 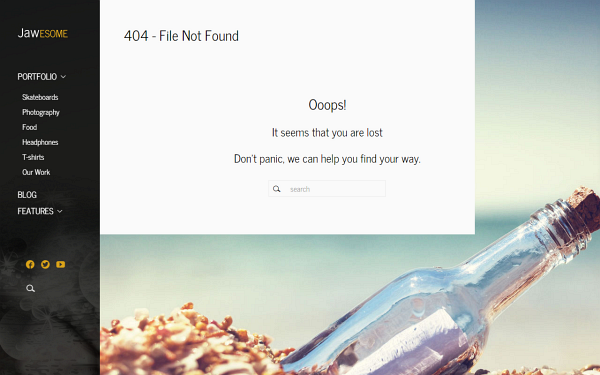 the second one is a sample of the Error 404 page on a gridded blog style. Here you can backup your current options and then restore them back at a later time. This is useful if you want to experiment on the options but would like to keep the old settings in case you need it back. Click the [Backup Options] button to backup your current saved options in the Category, Menus and Theme Options. If you need to restore the options, click the [Restore Options]. Please read carefully the warning message which will appear. You can easily backup your settings to the Google Drive. To do it, click the button. All the setting will be encoded and uploaded to your Google Drive. You can transfer the entire saved Theme Options data between different installations by copying the text inside the text box. To import data from another installation, replace the data in the text box with the one from another install and click the [Import Theme Options]. HINT: You can simply copy the data from the box to some txt file and keep it as backup. To import category options data from another installation, replace the data in the text box with the one from another install and click the [Import Category Options]. If you need or would like to upload the sample data to make your website look like our demo, click the thumbnail of the demo site you prefer. IMPORTANT: When uploading the demo content you may lose your data. Please don't forget to back-up your database before you choose an option. There are several special options that you can choose and set up for your page. If you want to be informed about new available updates, turn this option on. Here you can select the language of your choice for social plugins. Please visit the link at this option to get the language codes list. Facebook App ID: You have to enter your Facebook App ID to be able to share your site and to make a Facebook commentary. FB Comment Moderation Area: If you are a moderator, you will see notifications within facebook.com. If you don't want to have moderator status or want to see all comments in one area, use the Comment Moderation Area link. Here you can manage an antispam solution for comments on your site. Enable an Antispam Question: Turn the option on to enable an antispam question (specified below). Comments Antispam Question: Fill in the field with an easy question to be answered by user before inserting comment. Comments Antispam Answer: Insert a proper answer to the question. the following options allow you to make few basic optimalization settings of your page for search engines. Use Built-in SEO - the JaWesome theme uses built-in SEO solution. If you want to use some different SEO plugin, deactivate this option. Logo in H1 - turn on this option to put your logo between H1 tags. It may give better results for your site on search engines. The theme gives you several options to set beyond the common page settings you know from Wordpress. You can decide which of your pages to set as homepage. As you use the portfolio theme, it may be a good idea to set any of your portfolios as homepage. To do it, create a new page (Pages > Add New), set its options and don't forget to select the Overview of portfolio categories item from the Template dropdown list in the Page Attributes box. After selecting the item, a list of categories appears in the Portfolio Settings box at the bottom (see the 3.3 Portfolio Settings subchapter). Choose the category you want to show on your homepage, save the page and set it as homepage in a common way in Wordpress (Settings > Reading). Sample settings of a page that has to be used as homepage. 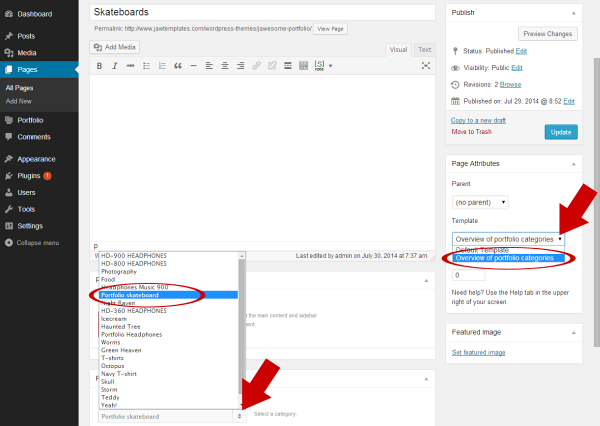 You need to select both the Overview of portfolio categories option in the Page Attributes/Templates settings and a category you want to show on your homepage. Example of a homepage that consists of the page we have set in the figure above. There are three preset layouts for your post content. Here you can choose one of them. If you choose layout with left or right sidebar, the following option will appear. You can choose one of the sidebars, you have created in the Sidebar Manager section and put it to the left or right. This option is available if you have selected the Overview of portfolio categories item from the Template dropdown list in the Page Attributes box (see the 3.1 Homepage subchapter). Choose a category you want to show on your page. Posts probably represent the most common content on your web. Here you can easily set up some special features for all your posts and for the each one of them separately. After you create a new post (Posts > Add New), you can see the mentioned options placed below the main content field. Obviously, there are the same settings available when you edit the posts you have already created. This option allows you to choose one of the preset layouts for your post page, with a sidebar on the left or on the right, or without it. 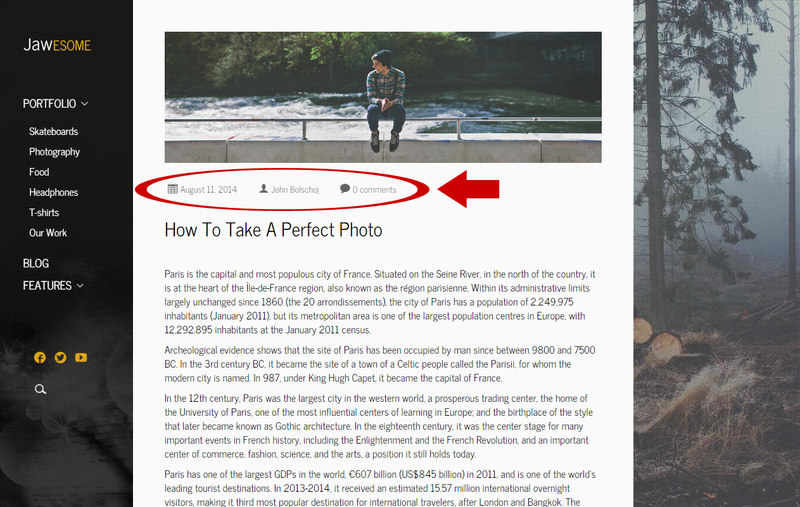 The Default Page Layout option uses the Post Layout set in Theme Options > Blog & Posts > Single Post. If you choose layout with left or right sidebar, the following option will appear. How to set a TOP IMAGE for your post? 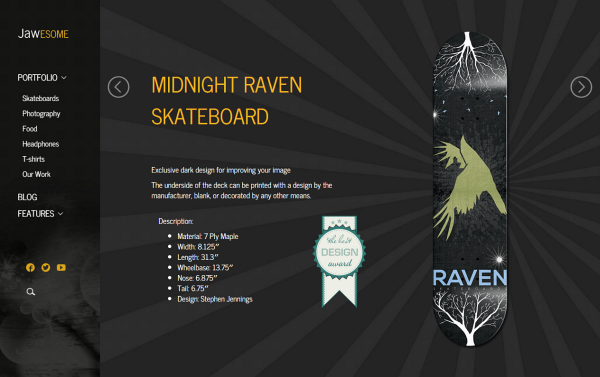 the theme allows you to fill a top background area of each partial post with a suitable graphics. For this purpose we recommend that you prepare a wide landscape image with sufficiently high resolution (its a good idea to keep the same dimensions for all the top images you use). Set the prepared top image as Featured Image, in an appropriate post settings. If your image isn't big/wide enough, it will be resized in width, but, depending on its aspect ratio, may be cropped in height. via the Featured Image option. Here you can decide whether or not to enable user rating using the J&W - Rate Post Widget (for more information, see the 7. Widgets chapter). the rating will be displayed in sidebar beside the post, according to settings of the mentioned widget. At first you need to create a category for your portfolio. Navigate to Portfolio > Categories, name your new category, set its options and add the new portfolio category or categories (e.g. Photography, Videography etc.) clicking the button below the options. Than go to Portfolio > Add New. Here you create a portfolio item which type can be defined selecting a desired option in the Portfolio Type dropdown list below the content field. Fill the field with description you want to add to your portfolio category. You may use HTML tags in the description. Fill the field with a portfolio category description text to be displayed in the placement you have specified in the options below (Show on Top, Show on Bottom, Show on Top - Hover, Show on Bottom - Hover). You may use HTML tags in the description. NOTE: This option is available only if you select the "List of Categories" from the "Display on Page" dropdown offer below). 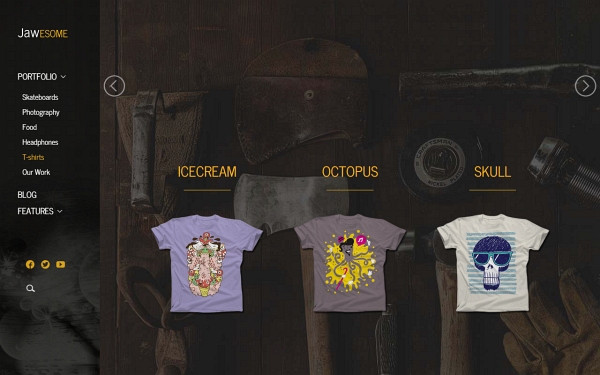 Click the [Choose Image] button and select the image which will represent your portfolio category. To remove the thumbnail image, use the [Remove] button. Click the [Choose Image] button and select the second image that will be placed according to the Show on Top, Show on Top - Hover, Show on Bottom and Show on Top - Hover settings below. To remove the thumbnail image, use the [Remove] button. You can choose an icon to be shown above the portfolio category. To get list of available icons, visit this page. Find the icon you like and put/type its class name into the empty field. You can choose an icon to be used as the second one, in the placement you set in the Show on Top, Show on Top - Hover, Show on Bottom and Show on Top - Hover settings below. To get list of available icons, visit this page. Find the icon you like and put/type its class name into the empty field. You can determine how to display the portfolio category on your page. Select an option you prefer from the drop-down list. NOTE: Depending on your choice, more or less other options will be available to set. 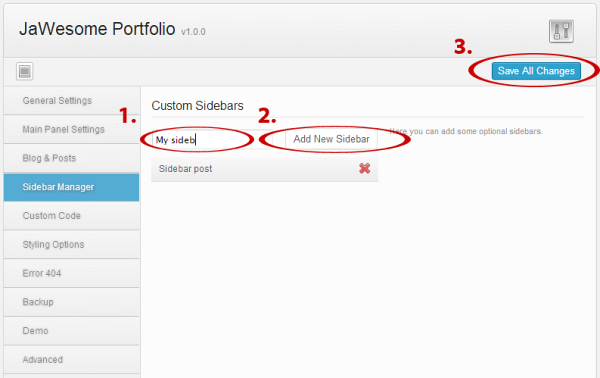 List of Items (Slider) - allows passing through your portfolio items using a slider feature. Grid List of Items - arranges your portfolio items into grid of image tiles. the images are fetched from the "Portfolio Image" set in each partial item's Portfolio Settings. Columns of Categories - presents your portfolios in groups, displaying the items side by side. You can pass through these groups using arrows. Notice that if you choose this option, several other options to set appear below. Columns of Items - presents your portfolio items in groups of items that are displayed side by side. You can pass through these groups using arrows. Notice that if you choose this option, several other options to set appear below. Compare the two different views of the same sample portfolio category (Photography). the first image shows the category with the Display on Page option set to Grid List of Items. the second one shows how the category appears if the option has been set to List of Items (Slider). Another example shows how looks a portfolio page if the Display on Page option has been set to Columns of Categories. the circled arrows allow you to pass through all the "T-shirts" subcategories. Click the image to explore this sample page on our live demo. There are two available sources you can choose a background for your portfolio category from. To use a common background you have set in the theme options, select the Theme Options item; to specify a background especially for the selected portfolio category, select the Custom Background item from the drop-down list. You can choose an effect to be applied when mouse is moved over the category item. We recommend trying each of the effects to find out which of them best suits your idea. This color affects a highlight effect if mouse is moved over the category item. Pick a color from the palette or enter a hex code. Choose what you want to display on the top of each your item in the list of categories. You can decide not to display anything or to choose from Icon, Icon2, Thumbnail or Thumbnail2 choices. NOTE: This option is available only if you select the "List of Categories" from the "Display on Page" dropdown list above. Choose what you want to display on the bottom of each your item in the list of categories. You can leave the place empty or fill it either with a description of the portfolio category or with an image, or with both of them. NOTE: This option is available only if you select the "List of Categories" from the "Display on Page" dropdown list above. Choose what has to appear on the top of each your item in the list of categories if mouse is moved over (compare with the "Show on Top" option above). NOTE: This option is available only if you select the "List of Categories" from the "Display on Page" dropdown list above. Choose what has to appear on the bottom of each your item in the list of categories if mouse is moved over (compare with the "Show on Bottom" option above) (compare with the "Show on Top" option above). NOTE: This option is available only if you select the "List of Categories" from the "Display on Page" dropdown list above. Set a background color picking a value from the palette or entering a hex code. NOTE: This option is available only if you select the "Custom Background" from the "Background Source" dropdown list above. 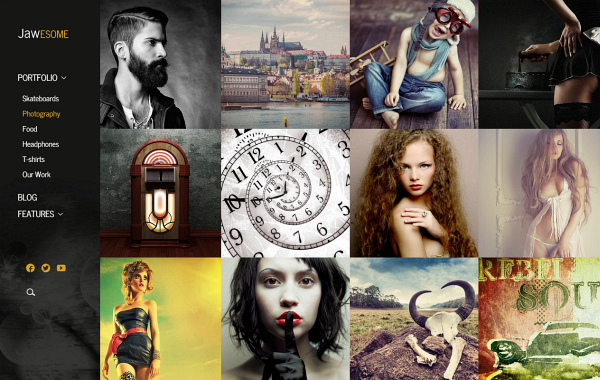 Choose an image to use as background of your portfolio category. There are two possible ways to use your background image. You can use just the clear image, or moreover to overlay the background by pattern. The second option is advisable e. g. if the image is not sharp enough or simply if you like this attractive effect. Choose a video in mp4 format you want to use as background of your portfolio category. NOTE: To ensure a proper functionality, you need to set both the mp4 and WebM (the option below) video. Choose a video in WebM format you want to use as background of your portfolio category. NOTE: To ensure a proper functionality, you need to set both the WebM and mp4 (the option above) video. Decide whether or not to use a background pattern. There are several options you can set for each your portfolio item. Select type of the portfolio item. You can choose from Image, Gallery, Video and Audio options. NOTE: These options affect a preferred part of content in your portfolio. E. g., if you have selected the Gallery option, just your gallery/graphic content is displayed at the top of page, followed by other content. Specify how to lay out content of the portfolio item. This setting affects an arrangement of your portfolio's main elements, like image, thumbnails and description. Horizontal - arranges the main image and other portfolio elements horizontally. Vertical - arranges the content vertically. Gallery - this setting is suitable especially for image galleries or the kind of content where a graphics is the main part of your presentation. in the Style of Single Portfolio settings. 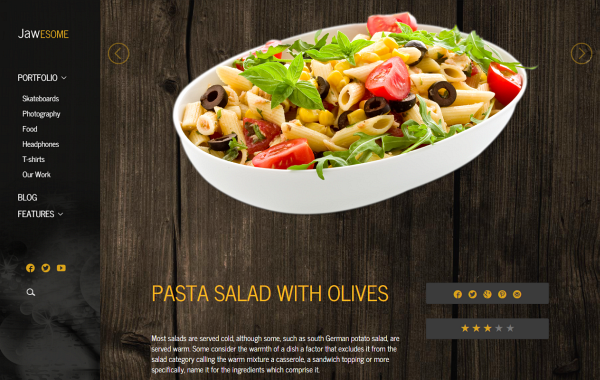 Click the image to explore this sample page on our live demo. 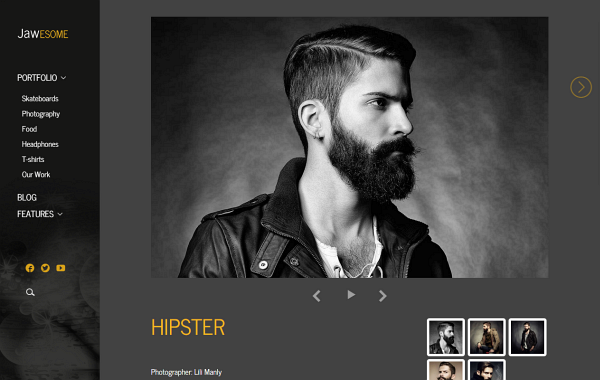 This example shows how the Gallery style of single portfolio may look like. HINT: As a final look of your portfolio may distinctly vary depending on graphics you'll use, we recommend that you compare different settings for a partial portfolio item to find out which arrangement looks better. E.g. for a content with the landscape-oriented wide main image seems to be a better choice the "Product Vertical" setting. Select the main image for your portfolio or use the [Remove] button to remove it. Click the [Edit gallery] buttton to be able to add or remove images and modify their order in your gallery. This functionality needs to be activated clicking on the image. In lightbox - opens lightbox to display your images. Changing the main image - displays pictures from the gallery on a position of the main image. NOTE: This option doesn't work if the Style of Single Portfolio option above has been set to Gallery. Click the [ + ] button as many times as how many videos you want to add, and fill each of the fields that appear, with the video source link. To remove the video, click the [ x ] button next to an appropriate field. Visit SoundCloud.com, find the record you want to present and click the "share" icon. When a new dialog appears (see the figure below), click the "Embed" option (1), choose a style you prefer (2) and copy the code you'll get (3) to clipboard. 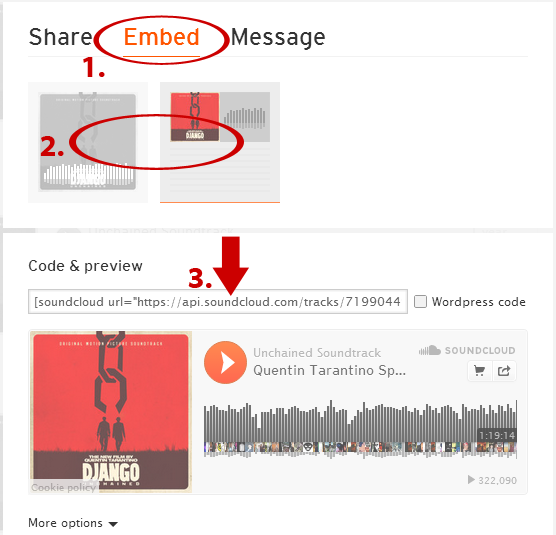 Use this shortcode as the SoundCloud Audio Source. NOTE: To use this option, you have to have installed and activated the SoundCloud Shortcode plugin and to have set an Audio Thumbnail (see the next option). Here you can set a thumbnail image for your audio record. Click the [Choose media] button and select an image, or remove the thumbnail clicking the [Remove] button. Decide whether or not to display Rating box in the portfolio item. If you choose the By Theme Options item from the dropdown list, the box will or won't be shown, depending on the setting in Appearance > Theme Options > Portfolio (see the 2.3 Portfolio subchapter). Decide whether or not to display "About Author" box in the portfolio item. If you choose the By Theme Options item from the dropdown list, the box will or won't be shown, depending on the setting in Appearance > Theme Options > Portfolio (see the 2.3 Portfolio subchapter). Decide whether or not to display "Share This" box in the portfolio item. If you choose the By Theme Options item from the dropdown list, the box will or won't be shown, depending on the setting in Appearance > Theme Options > Portfolio (see the 2.3 Portfolio subchapter). You may want not to use the same image for the portfolio item and for its preview in list of portfolio items (Columns of Items). If so, click the [Choose media] button and select an image to be used as thumbnail. the thumbnail will be placed in the position you have specified in Portfolio > Portfolio Categories > your parent category > (Show on Top, Show on Top - Hover, Show on Bottom or Show on Top - Hover). To remove the thumbnail, click the [Remove] button. If the parent portfolio category's Display on Page option has been set to Columns of Items, the thumbnail image that you set here will be displayed as the second one, placed in the position you have specified in Portfolio > Portfolio Categories > your parent category > (Show on Top, Show on Top - Hover, Show on Bottom or Show on Top - Hover). To set the image, click the [Choose media] button and select an image to be used as the second thumbnail. To remove the thumbnail, click the [Remove] button. has been set to Thumbnail. Compare with the picture below. appears if a parent category's Show on Bottom - Hover option has been set to Thumbnail 2. You can choose an icon to be shown above the portfolio item (compare with the Thumbnail 2 feature above). To get list of available icons, visit this page. Find the icon you like and put/type its class name into the empty field. Similarly to the Thumbnail 2 image option described above, if the parent portfolio category's Display on Page option has been set to Columns of Items, you can choose a second icon to be shown in the placement of your choice (see explanation of the Thumbnail 2 option above). To get list of available icons, visit this page. Find the icon you like and put/type its class name into the empty field. Fill the field with a portfolio item description text to be displayed in the placement you have specified in Portfolio > Portfolio Categories > your parent category > (Show on Top, Show on Top - Hover, Show on Bottom or Show on Top - Hover). Be aware, that the "Description 2" option works only if the parent portfolio category's Display on Page option has been set to Columns of Items. You may use HTML tags in the description. You can set your menu in a common way you know from Wordpress (in Appearance > Menus). However, when both the JaWesome theme and the JaW Menu for JaWesome template plugin are activated, you can find there a new Select JaW Menu Locations box added beyond the scope of standard options. If you use several menu positions, this feature allows you to assign the JaW menu to the position you need. the feature also ensures that your submenus are opened permanently. NOTE: Be aware, that you can only use one JaW Menu. NOTE: the permanently opened submenu ability doesn't work if the main panel/menu has been placed at the top of page using the Main Panel Placement option in Appearance > Theme Options. 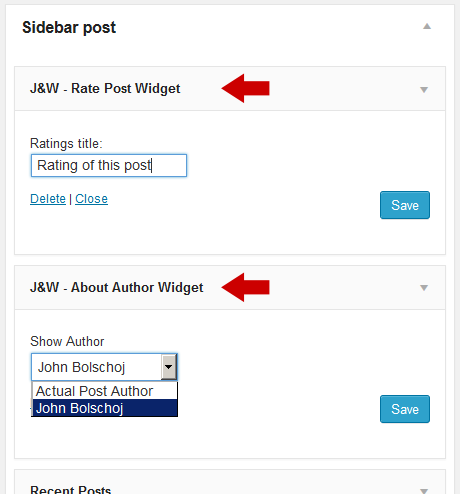 The theme comes with the J&W - About Author and J&W - Rate Post widgets included in the JaW Widgets plugin which needs to be installed separately. After you install the plugin, go to Plugins > JaW Widgets and tick or uncheck the J&W widgets you want or don't want to have available between widgets in Appearance > Widgets settings. Decide whether to show author of the actual post, in the side "About Author" box, or to show there a global author (one of those, you have added in Users > All Users). Choose a desired option from the Show Author drop-down offer. 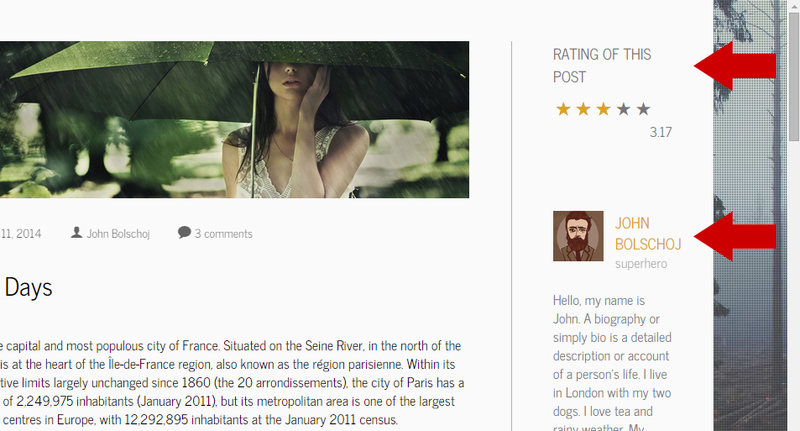 Use this widget to globally enable displaying of ratings in sidebar beside posts. Displaying of the ratings for each separate post, however, depends on the Show User Rating option in the post's General Settings (see the 4. Posts chapter). If you want to show a title above rating stars, type it in the "Ratings Title" field or leave the field empty (to display rating without title). Compare settings of both of the J&W Widgets (fig. above) with their appearance on a real sample page below. REMEMBER: the J&W Rate Post Widget can be displayed only in the posts whose Use User Rating option has been enabled. See the 4. Posts chapter. WordPress Shortcodes are a simple set of functions for creating macro codes to be used in post and page content. the JaWesome portfolio theme comes with several shortcodes allowing you to easily add styled content to your site. Some of them allow you to completely redefine the post or page content. Some shortcodes can embed files or create objects, some others can change the layout of the content. Conveniently, the available shortcodes have been included under the dropdown button in the WYSIWYG content editor which you can use when you add or edit the Posts or Pages. NOTE: In case of pair shortcodes you always need to put the part of your content which you wish to be affected, between the two bracketed code elements. Use the following syntax: [shortcode]Your text...[/shortcode]. Click the shortcode button to open up a dropdown list of the available shortcodes and their settings. Columns: Choose this item if you want to wrap your paragraph into some of the offered variants of columns. Content: You can add several content elements or parts of content like buttons, dividers, images and lists into your content. Headlines: You can use H1 to H6 tags for your titles and subtitles. 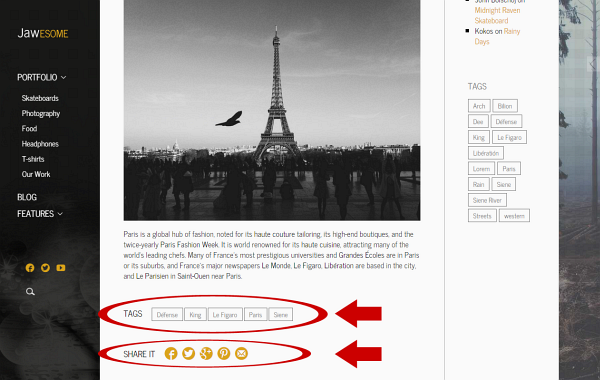 Social & Media: This set of shortcodes allows you to set and put social icons into your post. Text Content: You can format your text using a block quote style you choose. Get inspired of some prestyled typography in our demo.